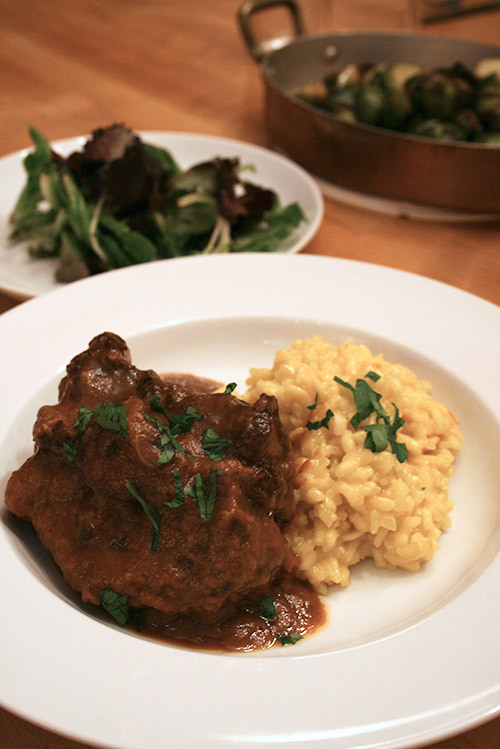 One of my favorite dishes to make from my beloved cookbook, Zuni Cafe Cookbook, is braised oxtail. I don't remember how many times I made this since I got this book more than 10 years ago. Recently I made it again for Valentine's day. I also have an oxtail pot pie recipe which uses leftover braised oxtail meat; a great companion recipe. Note: I cut everything into half from her original recipe. Original recipe can serve 4 - 6 people. 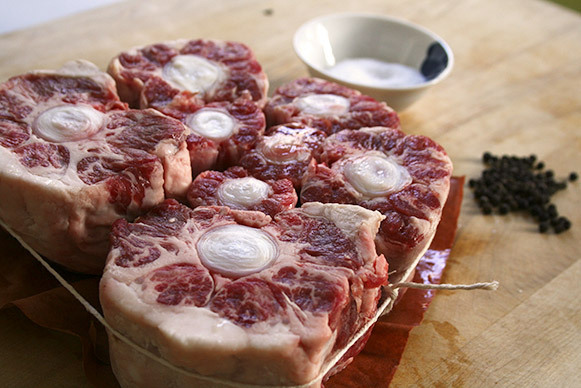 2 - 3 days in advance: Trim the oxtails of excess fat (do not remove the silver skin). Season all the meat liberally all over with salt. Cover loosely and refrigerate. Place beef stock in a small sauce pan and simmer gently to reduce to about 1 cup. It should be syrupy, not gluey. Wipe the pieces of meat dry. Warm a film of olive oil in a large skillet over medium heat. Add enough pieces of meat to loosely crowd the pan. Let brown lightly, about 3 - 4 minutes then turn to color the other side. Transfer the browned meat to the braising pan and brown the remainder. Pour off the fat and wipe the skillet clean. 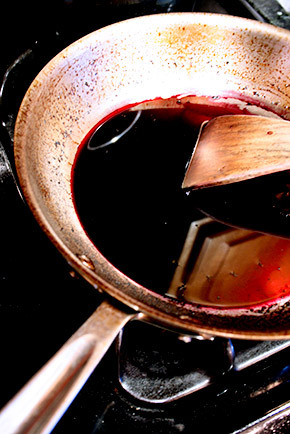 Set the skillet over medium heat and add the red wine and brandy. Stir and scrape as it sizzles. Then simmer until the wine has reduced by about half. Add the reduced stock and bring to simmer. Turn off the heat. Arrange the meat in the braising pan. Distribute the bay leaf, garlic, parsley and/or thyme, and black pepper around it, followed by the carrot, celery, onion, and tomatoes, filling the crannies between the chunks of meat. Add enough of the hot wine-stock mixture to come to about one-third the depth of the meat. 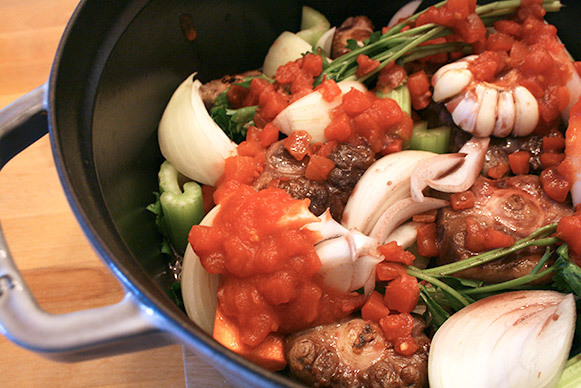 You may not need all of the liquid; save it for finishing the sauce or freeze it for your next braise. 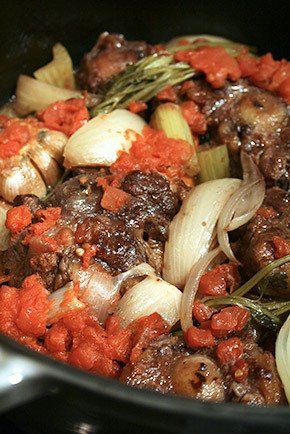 Set the braising pan over low heat and bring to a simmer. Tent the surface of the braise with parchment paper, then cover the pan with a tightly fitting lid or with foil, dull side out. 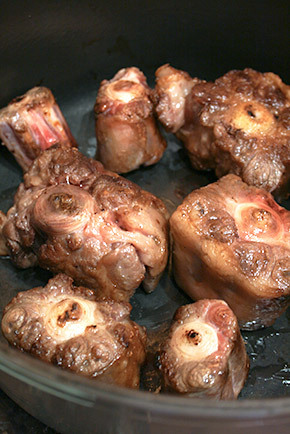 Place the pan in the oven and cook until the oxtail meat has just begun to pull from the bone, usually 3-1/2 to 4 hours. Check the doneness at 2-1/2 hours. After checking the doneness, leave the lid slightly ajar, or the foil loose, when you return the pan to the oven. 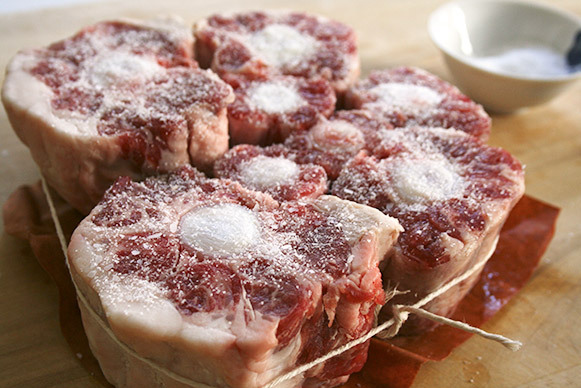 Check meat again at 20 - 30 minute intervals until it is tender but not collapsing. It will continue to soften as it cools. 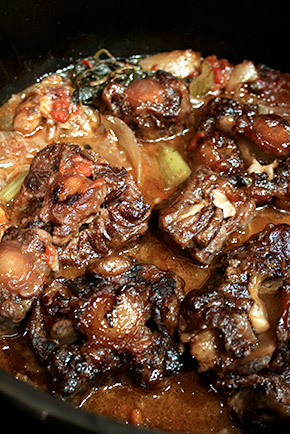 Once the oxtails are tender, remove the braise from the oven. Turn each piece of meat over to re-moisten. When the braise has cooled slightly, spoon off the fat. Transfer the pieces of meat to a separate pan. Taste the vegetables. If you like the flavor and texture, you can serve them as is. 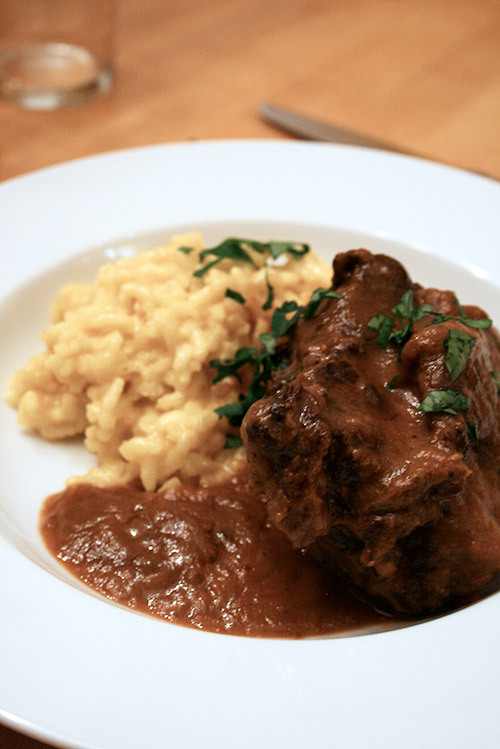 If their flavor is nice but their texture insipid, press them through a food mill or strainer and stir some or all of that puree into the finished braising liquid. If the vegetables are utterly spent, collect them in a strainer and place over a bowl to capture whatever liquid they release. Rinse them with a trickle of warm water, stirring the vegetables as you add it, to dilute and retrieve the sticky braising liquid clinging to them, then discard the vegetables. Skim the braising liquid again. Add the liquid from the vegetables, bring to simmer over low heat, and skim again. If it tastes weak and looks watery, simmer to reduce further. 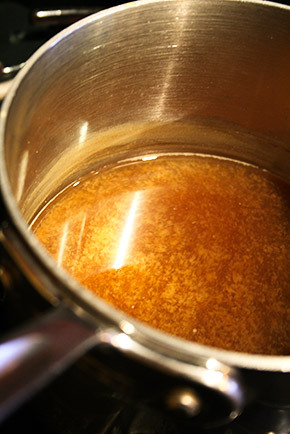 If the liquid is less than rich, consider further reduction, or add wine, stock, or extra wine-stock mixture. 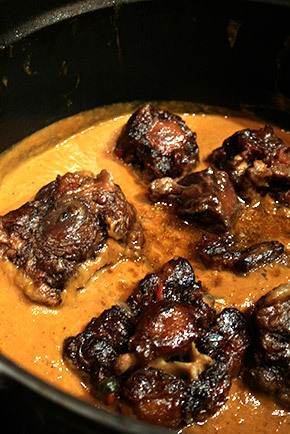 Combine the meat and liquid in the original braising vessel. 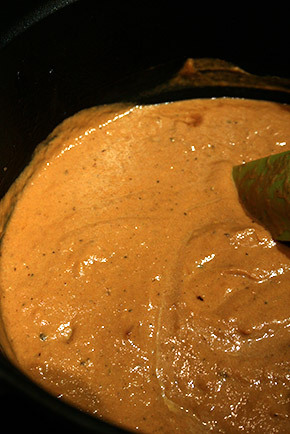 Bring to a simmer, then cover and continue to simmer until the meat is piping hot, 10 - 15 minutes.